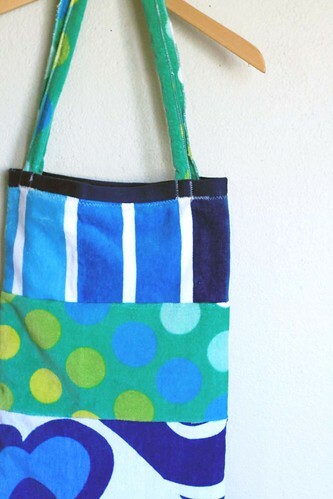 I've got another beach towel project for you! 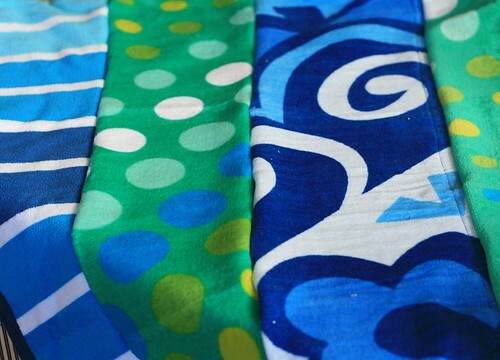 When I purchased that fabulous zebra beach towel (for cheap) to transform into hand towels, I also bought a few more to create with! 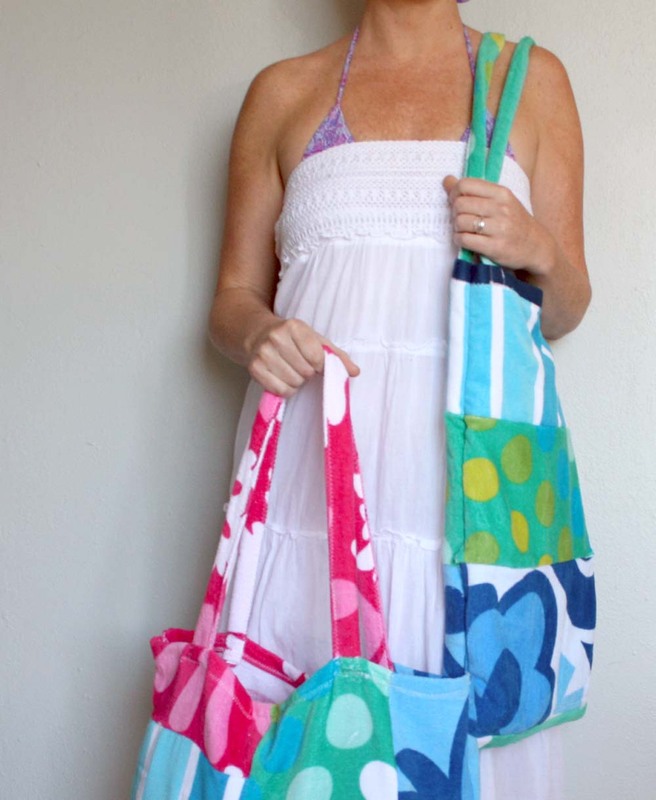 I knew that I wanted to come up with some colorful and fun tote bags for the beach and pool this summer! 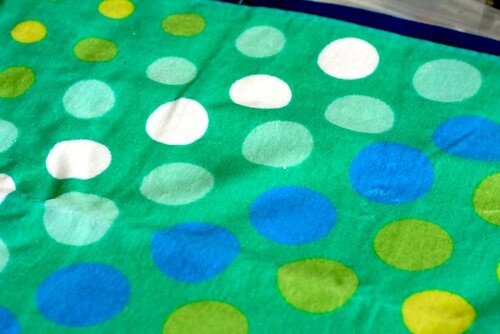 Thanks to Target these towels were $2.50 and I selected a few different bright colors and patterns. 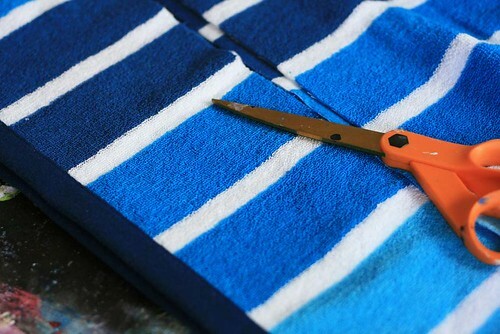 I started by cutting wide strips of towels. 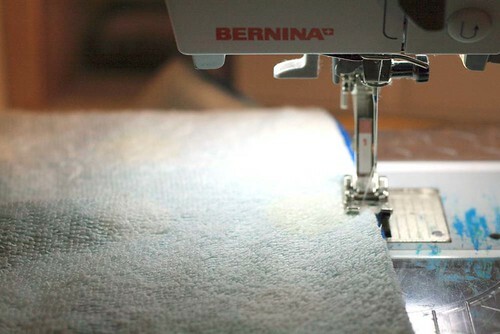 fyi- cutting up towels can me messy! Don't wear your favorite block yoga pants unless you are ok with getting tons of towel fibers all over them! 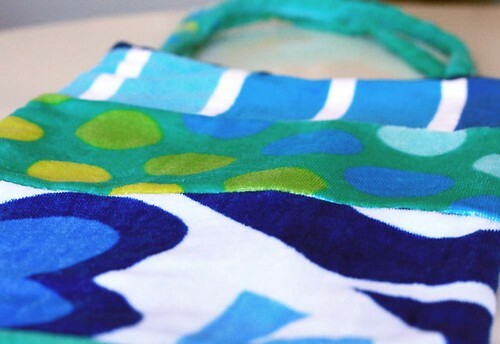 I picked blues and greens to pair together and laid them out in the size that I wanted- a front and back for the tote- roughly 11" X 20". 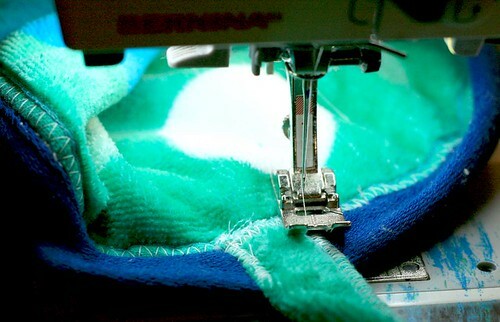 I sewed the strips together. and for the strips that were sewn into handles. 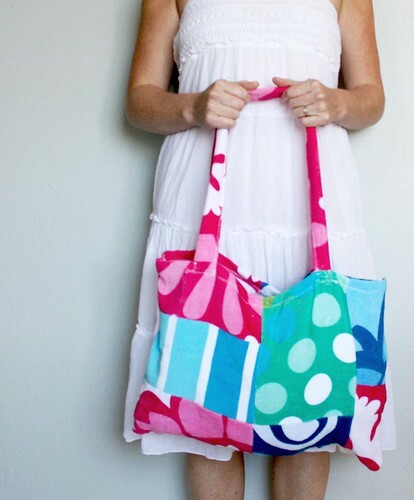 The result is a SUPER cute and TOTALLY functional beach bag! Since I can never make just one of anything I made another bag but for this one I used squares sewn together! Fantastic Alisa! 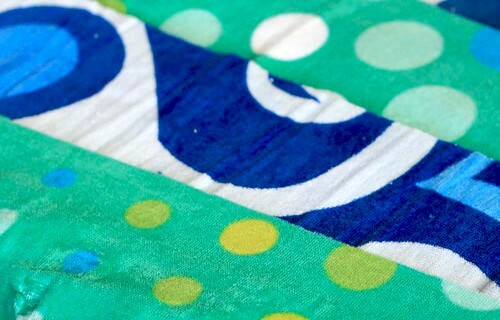 I notice some great beach towels at Wal-mart too! Great project! Can you say "A-DORE-ABLE!" You are SOOOO creative Alisa! Thanks for sharing your wonderful ideas. Super clever of you my dear. Thank you for sharing your talents. Gorgeous - not sure if we can get beach towels for that sort of price over here - but think I'll start looking now! Love it, looking out for cheap towls now. 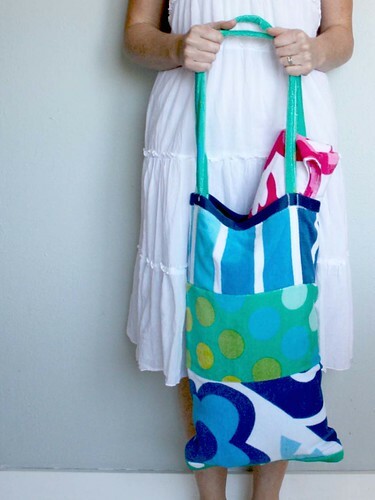 This is great - at last a deep beach bag that can cope with rolled towels without them falling out of the top... well designed. Totally awesome! 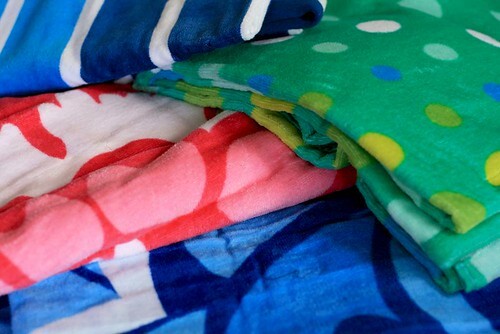 I've been thinking about using our old bath towels and quilting a beach blanket with them - this works for towels too! Thanks for the great idea! I love the deep bag! Thanks so much Alisa, I'll be linking. What a great and useful idea. I am so going to try this! I love it! I'm definitely trying this! Now I follow this blog! 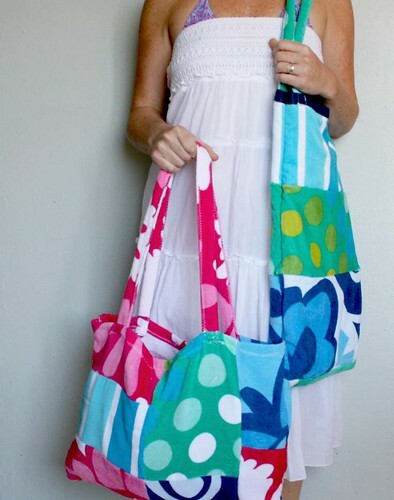 This is a great idea.Very stylish! Thanks for putting this fun tutorial together. 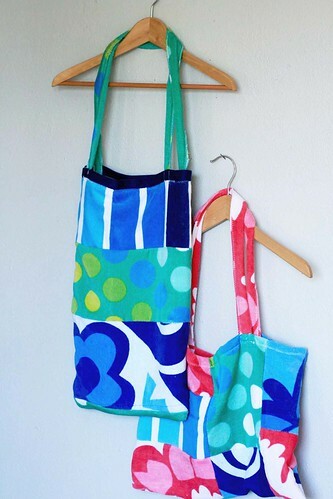 I have featured it in a post I posted today about great gift tutorials for women and girls. 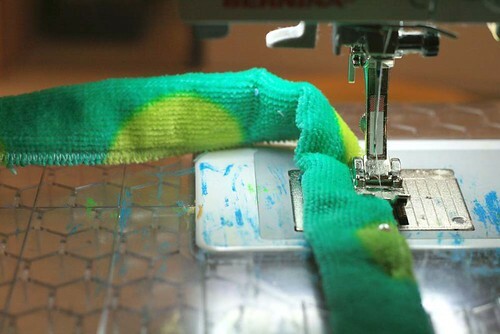 I am looking forward to making a few of these! 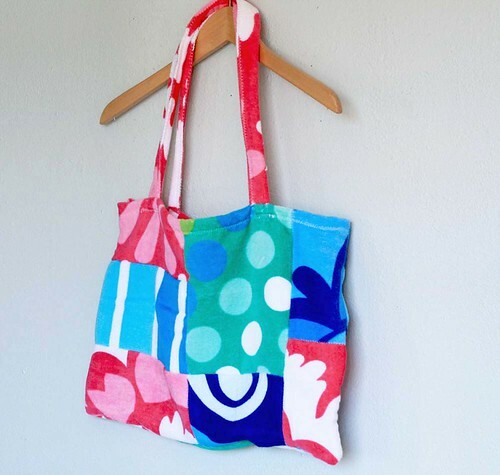 Beach totes - Ella Vickers Sailcloth Collection (EVSC) is a selection of Recycled Sail Bags, Sailcloth totes, Sailing, Tote bags, Seabags, Duffel, Beach totes.